Siona, the human girl, fears what her mother loves most--the sea. Her fears escalate after her bloody encounter with a ragworm at the beach. 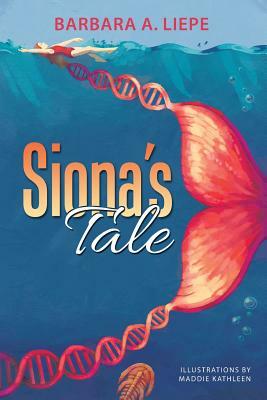 Her marine biologist mother, on the verge of a scientific breakthrough in metabolic evolution, starts a story, Siona's Tale, about a tiny sea squirt, hoping that her daughter may marvel at the wonders of the sea and the powerful connection all creatures share. Siona's Tale is an adventure in science and fiction. Siona the Sea Squirt hatches out of her egg 521.2 million years ago--her creation the result of a rare horizontal gene transfer event. Life is hard on sea squirts, but particularly hard on Siona. That's because she loves to swim with her mighty tail. She is devastated when she learns that she must lose her tail, stick her head to a rock, and never swim again. That's just what happens to sea squirts when they grow up. Against all odds, Siona sets out on a journey to save her beloved tail, making friends along the way with a cast of marine invertebrates, including a clairvoyant clam and a prophetic trilobite. Siona encounters toxic slime, lash-like flagella, predatory spiders, pistol-toting shrimp, photons from wee sea beasties, mutants, DNA and ATP, improbable events, dumb luck, friendship, love, and her destiny-- a destiny upon which the human race depends. "It is a story that feels like an actual experience . . . It's unique, compelling, and thought-provoking . . . We want young people (and people of all ages) to read this book Think of the nerdy youth out there waiting for a book like this "
--Dr. Charlene Stone, biology teacher at Canyon Del Oro High School.